Once you’ve seen Acacia wood flooring the chances are you’ll never forget it. It certainly is unique in appearance and not for those who like uniformity in their flooring, as you can see from the image below. 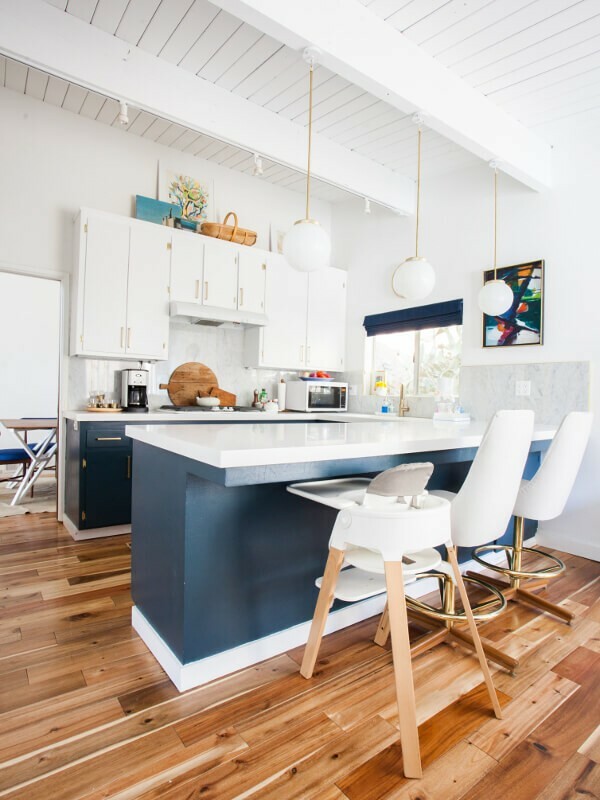 At Home Flooring Pros we think there’s something sensual and luxurious about this wood, but accept that it would only suit certain properties and even then should perhaps be used as part of a carefully considered interior design scheme. Read on to find out more about Acacia wood and whether it’s right for you. Acacia is a term that refers to more than 1,200 varieties of tree and shrub species that are native to Australia and Africa, but are also grown in parts of Asia, the Pacific Islands and North America. These varieties grow in diverse habitats including rainforests, woodlands and coastal dunes. The acacia species used in hardwood flooring are grouped into two categories: small leaf acacia and large leaf acacia. Acacia is known by several other names, most commonly asian walnut and wattle. It is marked by a wide, open and modulating grain pattern combined with distinctive knots that produce beauty and interest. The wood is also resistant to water, mold and fire (NOTE-fire resistant, not fireproof!). Acacia trees and shrubs also provide seeds that are ground into flour rich in fiber and protein, edible gum with antibacterial properties, tannins for tanning, and tinctures and ointments to treat a range of digestive and skin maladies. Like most wood flooring species, acacia is used in the production of three types of products. Solid Acacia flooring is 3/4″ (19mm) thick. Plank width ranges from 3” to 5”. Standard and hand scraped acacia flooring is produced in solid wood. Engineered Acacia flooring is available in 3/8” (10mm) and 1/2″ (12mm) thicknesses with plank widths from 3” to 5”. As with solid flooring, standard and hand scraped engineered acacia are made. Engineered acacia has an engineered plywood base and a solid acacia wood wear layer. Laminate Acacia flooring features a photographic applique of acacia wood fused to a wood composite base and covered with a clear, protective wear layer. It is made in thicknesses from 1/4” (7mm) to 9/16” (15mm) and a variety of plank lengths. Several colors are available in all the acacia flooring products. Warranties are as little as 5 years for cheap acacia laminate to 50 years for solid hardwood flooring. Solid hardwood flooring: TAS Flooring, Mazama and US Floors with prices from $3.00 to $8.00 per square foot. Products include standard, hand scraped and hand carved finishes. Engineered flooring: Jasper at Build Direct, Saso, Armstrong, LM Flooring, Green Touch and Mohawk with pricing from $2.60-$8.00 per square foot. Hand scraped and hand carved flooring is available in addition to standard finish. Laminate flooring: Lamton, Mohawk and Armstrong with pricing from $0.80 to $3.50 per square foot. Styles mimic solid and engineered flooring options. There are hardwood flooring pros and cons for all species, and the following list will assist you in comparing acacia to the other hardwood types you’re considering. Color variety and beauty – The large number of species used for flooring gives you an excellent selection of colors from chocolate brown through rusty reds to off-whites and golden yellows, all with acacia’s distinctive grain patterns and textures. However, note the acacia flooring problems below for more information about color variation. Options – This flooring is produced in solid, engineered and laminate in a variety of plank widths and detail choices such as popular hand scraped and hand carved finishes. Durability and wear – Acacia is harder than oak and maple and provides many years of dependable wear before refinishing or replacing is required (see Durability & Hardness below for more details). Easy maintenance and low costs – Acacia flooring is easily maintained with sweeping or just-damp mopping, so the floor won’t trap allergens and dirt like carpet does, and no special cleaners are required. Click here for the best mops for the job. Cost – Most acacia flooring is moderately priced which, combined with its durability and low maintenance requirements, produces outstanding cost value over the lifetime of the floor. Sustainability and Eco-friendliness – This is a green flooring choice because acacia grows quickly, harvesting is managed in most areas, production requires fewer emissions than many flooring choices and the wood is recyclable and reusable. Versatile installation – Installation options vary by manufacturer and product but include nailing, gluing and floating the material. Short plank lengths – Because acacia plants used in flooring are usually shrubs or short trees, long planks are not possible. Knots, stains, variations and defects – While you might enjoy the rustic and varied character of acacia, some prefer wood flooring that is “cleaner” and more consistent. Because it is so distinctive, it is also therefore a very personal choice which will not appeal to everyone – so it could be a negative factor when/if you come to sell your home. Possible shrinkage – Acacia flooring problems occur when the wood hasn’t been properly kiln dried and in very dry homes. 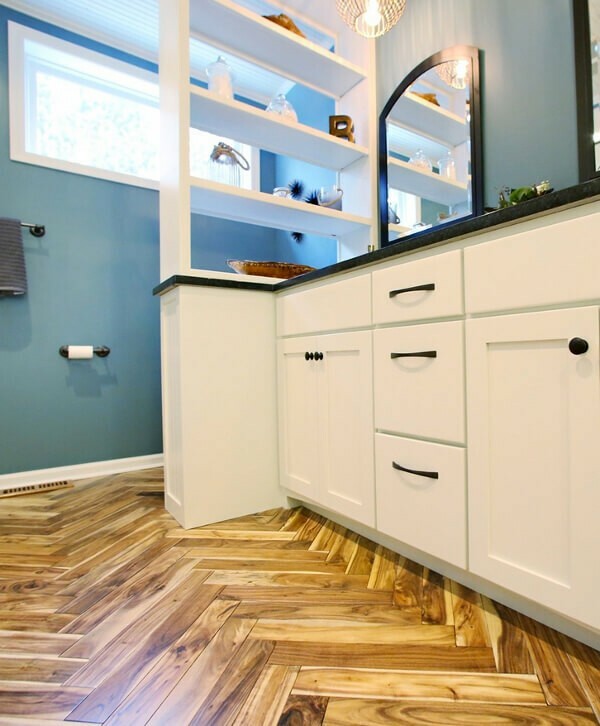 Expense – This is a pro and a con because acacia costs less than many exotic wood species but is still costlier than most carpet and sheet vinyl flooring. See Acacia Flooring Problems below for more information on what can go wrong with this material. One of the reasons to consider acacia hardwood flooring is its hardness. The Janka Hardness Rating for small leaf acacia is 2220 and for large leaf acacia is 1700, so the wood is harder than popular species like hard maple (1450), white oak (1360) and red oak (1290), though not as hard as exotic woods such as African cedar (2600) and Brazilian walnut/ipe (3670). The hardness of acacia wood offers two significant benefits. First, it wears well, so is very durable. With proper care, solid acacia hardwood flooring will last 50-100 years depending on its thickness. It can be refinished multiple times over its lifetime and look like new each time. Secondly, acacia’s hardness makes it less susceptible than softer woods to dents, gouges, scratches and other damage. It is a good choice for families with pets, active kids and their toys and anywhere very heavy furniture will be used. Acacia is popular in commercial settings, though warranties are shorter than when used in residential application. Click here for other durable flooring options. We’ve mentioned potential acacia flooring problems that you should consider before selecting it for your home or business. Here are more details. Plank lengths are just one to four feet due to the limited height of acacia shrubs and trees. Each case of acacia flooring will contain planks of various lengths, but the average might be less than two feet. Compare that with the industry standard length of 3.5 feet. Consider a room 20 feet long. Each row will likely have eight to twelve seams when acacia is installed versus just five or six with most other hardwood species. Color variation in acacia wood is more extreme than with most hardwoods. As a result, your installed flooring will likely show more colors than the flooring sample you used to make your selection. For example, if you choose a sample that is rusty brown, that color will dominate, but each plank might also show deep brown, golden tans or off-white hues from combining both heartwood (darker) and sapwood (lighter). Knots and small defects are more prevalent in wood produced from short, shrubby trees because of shorter trunks and branches that are often twisted. Getting long runs of clean acacia isn’t possible. To harvest any usable timber from acacia, wood with knots, mineral stains, noticeable color variation and other blemishes must be included. The first three acacia floor problems might not be a concern to you. The thousands of homeowners that have made acacia a trending home flooring material view them as part of the uniquely appealing appearance of this beautiful wood. The final issue with acacia flooring is overcome with the solutions provided. 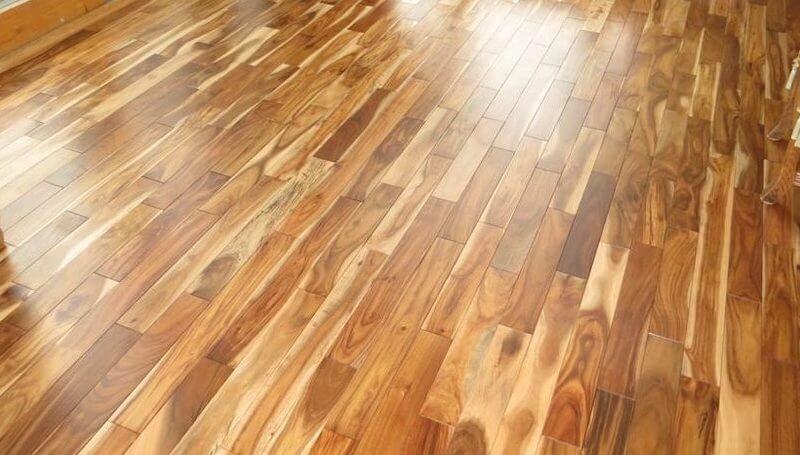 In short, if you love its rich and varied beauty, the potential acacia problems shouldn’t stop you from putting it on your short list of possible flooring materials. Can the acacia hardwood Wood floors be vacuumed with the dyson v8? It has a beater on the vacuum but says it’s safe on all hardwood floors. Also does this flooring need to have a sealant or polyurethane coat put in it as we have noticed some small diets already on the flooring less than 1 months th. Hi Aly, what kind/brand of acacia flooring have you installed? Pre-finished? Re the Dyson V8, doesn’t it have a separate attachment specifically for us on wood/hard floors? Can you tell me anything about the company Healthier Choice? Were considering engineered acacia flooring from this company. We are wondering if they use formaldehyde? Thank you! What is the best way to fill Large scratches? Looking to install an engineered espresso finish acacia flooring in our home with west facing large picture windows. Is fading a concern? We have kids, a dog and lots of toys so the durability is what gets my attention. Just don’t want a rug to completely ruin the floor 5 years from now. Aloha, Acacia’s variety in color and pattern really draw me to it. One thing I’m wondering about is the humidity. I live on the beach in Hawaii. We have old tile in our house now but want to put solid hardwood floors in. Flooring stores keep telling us we need to put in engineered hardwood but we don’t like the look of it. We like Acacia, mesquite (which nobody here has heard of using), Hickory, and the Brazilian hardwoods. But some of the Brazilian woods look a little too perfect for us. We don’t want to be worrying about our guests or kids or dogs messing up the floors. We had white oak floors for 30 years in CA and they were perfect because even if they got scratched it wasn’t very noticeable and we refinished them a couple times over those years. 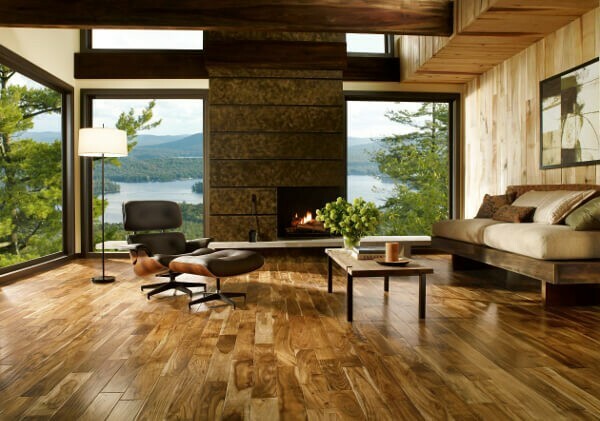 Sales people also try to push wood-look tile but we want the feel and warmth of wood. We’ve been in many homes on the island with solid hardwood floors. I have used Bona cleaner and a combination of white vinegar and water as suggested by the salesperson who sold me the flooring. The floor comes clean but these cleaners do not remove scuff marks. I have even tried using a towel on my hands and knees to rub them out. hesitant to try anything else because I love the floor and don’t want to do any damage. We’ve had the Abode Acacia Rustic flooring installed in our kitchen/living/dining room space. We’ve been back in the space less than 3 weeks and I’ve already seen a number of scratches and gouges in the floor. I’m really disappointed as it would have only been a little bit more to put traditional oak hardwoods in – the ones we previously had with the clear coating on was super durable. These were installed, were already pre-finished and there was not an option to put an additional seal. Anyone else seeing these problems? Hi Jennifer, doesn’t this flooring have a 25 year residential wear warranty?